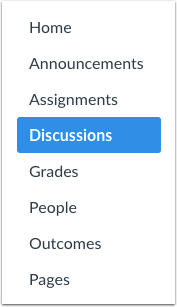 You can allow students to attach files to a discussion by changing the settings from the Discussions page. Any attachments added to an ungraded discussion by a student are copied to the student's user files and count against the user quota. However, attachments added to a graded discussion are not counted against the quota. This setting can also be changed from the Course Settings page. Note: If a student creates a discussion with an attached file, the file will be added to course files in the unfiled folder. Check the Attach files to discussions checkbox. Note: Unchecking this option will restrict students from attaching files within Discussions. 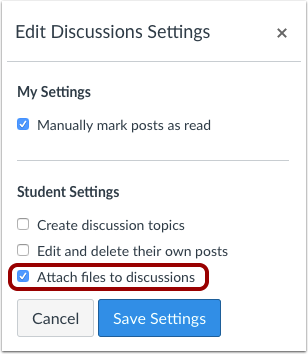 This permission affects posts in new discussion topics, discussion replies, and discussions within course groups. Previous Topic:How do I allow students to like replies in a discussion? Next Topic:How do I allow students to edit and delete their own discussion posts in a course? Table of Contents > Discussions > How do I allow students to attach files to a course discussion? Re: How do I allow students who have worked in groups to upload documents to all to see and share?